While embryonic stem cells are widely studied, a lesser known, but still significant, population of stem cells also resides within the early developing embryo: trophoblast stem cells (TSCs). In brief, in most mammals the trophoblast is the part of the early embryo that later significantly contributes to the placenta of the fetus. The embryo and mother work together to create the placenta; while the trophoblast of the embryo becomes the chorion part of the placenta, the maternal uterine cells and surrounding blood vessels form the maternal placental components (Gilbert, 2003). The placenta is the organ in mammals that connects the uterine wall to the developing fetus, bringing the two blood systems close together. The placenta allows the fetus to safely receive essential gases, such as oxygen, and nutrients from the mother. At the same time, it also lets the fetus expel waste through the mother’s kidneys. Additionally, the placenta releases essential pregnancy-related hormones and growth factors that, for example, let the uterus hold the fetus. Lastly, the placenta secretes immune response regulators to give the fetus immune protection against the mother (so that the fetus is not rejected by the mother’s immune system, as a tissue graft or organ transplant would be) (Rossant and Cross, 2001; Gilbert, 2003). Overall, the placenta plays a key role in early development; even small abnormalities in the placenta can lead to death of the fetus (Rossant and Cross, 2001). Figure 1: The blastocyst is a hollow sphere made of approximately 150 cells and contains three distinct areas: the trophoblast, which is the surrounding outer layer that contains the trophoblast stem cells and later becomes the placenta, the blastocoel, which is a fluid-filled cavity within the blastocyst, and the inner cell mass, also known as the embryoblast, which can become the embryo proper, or fetus, and is where human embryonic stem cells are isolated from. When the late blastocyst is implanted in the uterine wall, at day 7 or 8 in human development, the trophoblast stem cells (in the trophoblast) quickly differentiate to form cells required for a firm implantation and, later, for the placenta. While TSCs give rise to the placenta, these stem cells establish their identity long before the placenta develops; their fate is determined during the early embryo. Soon after the egg and sperm join during fertilization, the resultant zygote (fertilized egg cell) starts undergoing cell division. The resulting cells continue to undergo synchronous cell division. When the embryo is at the 16-cell stage (called a morula), it is a solid sphere of cells and already the precursors of the trophoblast cells are defined; the external, relatively larger cells mostly become the trophoblast cells. By the 64-cell stage, these cells’ fates are set; while the trophoblast will become the placenta, the other cells in the embryo can become the fetus. In mammalian development, this is the first differentiation event (Rossant and Cross, 2001; Gilbert, 2003). 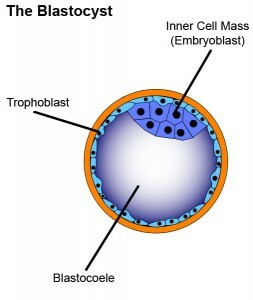 A few cell divisions later, the trophoblast contributes to significant cellular rearrangements in the embryo which make it enter the blastocyst stage (see Figure 1). The blastocyst, which contains approximately 150 cells, is made up of three main parts: the blastocoel (an internal, fluid-filled cavity), the inner cell mass (ICM), and the trophoblast. When the embryo was a morula, the surrounding trophoblast precursors caused fluid to be secreted into the morula (utilizing sodium pumps in the trophoblast cell membranes); this secretion created the blastocoel cavity. The ICM is a cluster of cells inside the blastocyst that will later become the adult organism; human embryonic stem cells can be derived from the ICM, as was previously discussed. Lastly, the trophoblast is a monolayer of cells, specifically polarized epithelial cells, which surround the blastocoel and ICM, similar to their future role of surrounding the fetus as its placenta (Rossant and Cross, 2001; Gilbert, 2003). A great deal of cell signaling occurs right before implantation of the late blastocyst into the uterine wall in order to ready the trophoblast for the next developmental stage, gastrulation. Prior to implantation, the ICM and neighboring trophoblast cells secrete proteins that make the trophoblast become highly proliferative and take on different, distinct trophoblast characteristics. Upon uterine implantation, which occurs around day 7 or 8 in human development, the trophoblast differentiates into a variety of extraembryonic (outside of the embryo proper) structures to assist with implantation and placenta development. To firmly implant the embryo, trophoblast cells ingress into the uterus wall. Figure 2: After the blastocyst is implanted in the uterine wall, it rapidly and significantly undergoes cellular reorganizations to become a gastrula. The gastrula is distinct for having differentiated, or developed, into the three germ layers of the fetus, which are labeled: the endoderm, the ectoderm, and the mesoderm. While these three layers are the predecessors of the adult organism’s cells, the stem cells of the trophoblast differentiate into cells that support the developing fetus; trophoblast cells ingress into the uterine wall (top of the gastrula image, in green) to firmly attach the embryo and trophoblast cells also surround the entire embryo (green), significantly contributing to the formation of the placenta. While the internal components of the developing gastrula undergo significant rearrangements, during gastrulation the extraembryonic portions are also rapidly changing, anchoring the embryo on the uterine wall and establishing an exchange of nutrients and gases with the mother. At this time, the TSCs give rise to cytotrophoblast stem cells, which are precursors of all trophoblast cells. The cytotrophoblast makes up the inner single cell layer of the trophoblast, surrounding the gastrula and anchoring the chorion to the maternal endometrium. Some cytotrophoblasts will later become stem cells in the chorionic villi, which provides more surface area on the chorion to maximize contact to the maternal blood supply (Rossant and Cross, 2001; Gilbert, 2003). TSCs can ultimately become one of many different trophoblast cell types, making them multipotent stem cells. The TSCs on the ICM proliferate and become the extraembryonic ectoderm and the ectoplacental cone (Oda et al., 2006). The extraembryonic ectoderm includes cells that can become syncytiotrophoblasts, which make up the outer trophoblast layer. This outer layer becomes thick, multinucleate, and is exterior to the gastrula; these are the cells that ingress, or enter, into the uterine tissue (invading the maternal extracellular matrix, which is a collection of proteins surrounding cells that help the cells adhere and communicate with each other) (Rossant and Cross, 2001; Gilbert, 2003). To become motile and ingress, the trophoblasts undergo an epithelial-mesenchymal transition, becoming moving mesenchymal cells, but after they have reached their destination and implantation is complete, they undergo a mesenchymal-epithelial transition, becoming epithelial and much less mobile (Abell et al., 2009). The syncytiotrophoblast also secretes progesterone and other hormones to sustain pregnancy. The ectoplacental cone contains a variety of cells, including ones involved in implantation as well as the creation of the placenta. Some cells of the ectoplacental cone become spongiotrophoblasts, which form the middle layer of the placenta. TSCs on the side of the embryo opposite of the ICM become the trophoblast giant cells, which are non-proliferative cells required for implantation that are made up of several subtypes (Rossant and Cross, 2001; Moore et al., 2008; Liu et al., 2009; He et al., 2008). The ICM is thought to signal nearby TSCs to remain in a proliferative, stem cell state, while further away TSCs differentiate (Rossant and Cross, 2001). By understanding the early embryo, researchers have learned how to better culture these TSCs, and at the same time TSCs have taught scientists much about this unique developmental environment. TSCs are thought to exist during the blastocyst to early gastrula stages, including after implantation. Like most stem cells, TSCs lose their potency as development progresses, although some rare TSCs have been found in later-stage extraembryonic and chorionic layers (Oda et al., 2006). Fibroblast growth factor 4 (FGF4) is known to activate TSC self-renewal and proliferation, and it is a necessary supplement for growing TSCs in culture (Abell et al., 2009; Himeno et al., 2008). Interestingly, TSCs have recently been found to also require an environment free of male hormones, which was suspected (Epple-Farmer et al., 2009). However, TSCs have not yet been successfully isolated from humans, though they have been isolated from mice, which is what most of the data presented here is based on, as well as monkeys. TSCs are very likely present in humans as well (Douglas et al., 2009). TSCs have potential for use in regenerative medicine as well as developmental models. Their great appeal for use in regenerative medicine is due to their being immune privileged, as this is one of their roles during development of the embryo. TSCs have been found to also allow immunoprotection to other cell types they are co-transplanted with. However, there is some concern over this use of TSCs because they are such highly proliferative and invasive cells (Epple-Farmer et al., 2009). Additionally, TSCs can serve as a model for placental development. Although human embryonic stem cells can become trophoblast-like cells in culture, these cells are not very proliferative; TSCs are thought to be much better models (Moore et al., 2008). Abell, A. N., Granger, D. A., Johnson, N. L., Vincent-Jordan, N., Dibble, C. F., and Johnson, G. L. Trophoblast Stem Cell Maintenance by Fibroblast Growth Factor 4 Requires MEKK4 Activation of Jun N-Terminal Kinase. Molecular and Cellular Biology. 2009. 29(10): 2748-2761. Douglas, G. C., VandeVoort, C. A., Kumar, P., Chang, T., Golos, T. G. Trophoblast Stem Cells: Models for Investigating Trophectoderm Differentiation and Placental Development. Endocrine Reviews. 2009. 30(3): 228-240. Epple-Farmer, J., Debeb, B. G., Smithies, O., Binas, B. Gender-Dependent Survival of Allogeneic Trophoblast Stem Cells in Liver. Cell Transplantation. 2009. 18(7): 769-776. Gilbert, S. F. Developmental Biology. Seventh edition. Sinauer Associates, 2003. He, S., Pant, D., Schiffmacher, A., Meece, A., Keefer, C. L. Lymphoid enhancer factor 1-mediated Wnt signaling promotes the initiation of trophoblast lineage differentiation in mouse embryonic stem cells. Stem Cells. 2008. 26(4): 842-849. Himeno, E., Tanaka, S., and Kunath, T. Isolation and manipulation of mouse trophoblast stem cells. Curr. Protoc. Stem Cell Biol. 2008. Unit 1E.4. Liu, J., Xu, W., Sun, T., Wang, F., Puscheck, E., Brigstock, D., Wang, Q. T., Davis, R., and Rappolee, D. A. Hyperosmolar Stress Induces Global mRNA Responses in Placental Trophoblast Stem Cells that Emulate Early Post-implantation Differentiation. Placenta. 2008. 30(1): 66-73. Moore, H., Udayashankar, R., and Aflatoonian, B. Stem cells for reproductive medicine. Molecular and Cellular Endocrinology. 2008. 288(1-2): 104-110. Oda, M., Shiota, K., and Tanaka, S. Trophoblast stem cells. Methods in Enzymology. 2006. 419: 387-400. Rossant, J. and Cross, J. C. Placental development: Lessons from mouse mutants. Nature Reviews Genetics. 2001. 2: 538-548. Original “The Blastocyst” image modified from the Wikimedia Commons and original “The Three Germ Layers” image from the Wikimedia Commons. Both are redistributed freely as they are in the public domain. admin	Trophoblast Stem Cells	developmental, embryonic, regenerative medicine	© 2009-2010, Teisha Rowland. All rights reserved.